Medemer is a rallying cry popularized by the Ethiopian PM Dr. Abiy to rally his people to be included in the big tent he is pitching. It is a brilliant method of building a mass movement from scratch. It is positive, catchy and plays to the human need to be included. No one wants to be left out. I am in. It has worked like a charm. It has spread like a prairie fire inside Ethiopia and everywhere Ethiopian exiles live. That means planet earth. There is no continent where Ethiopians have not settled. ‘Medemer’ has helped us express our sentiments regarding the changes taking place in our homeland. We had such a public gathering in our town this weekend to show our support to PM Abiy and the new day he has ushered. The fact that the gathering was held to celebrate achievement instead of protest against dictatorship and injustice was something different. The new PM has managed to change our attitude towards each other, our country and life in general in a positive manner. I saw many new people carrying the flag, wearing the flag and even the flag colors painted on their body. I also saw lots of my old friends that have been marching against any Woyane aggression. Last Saturday opened a new chapter in our quest to be free. PM Abiy defined the concept of Medemer during his speech at the dinner for President Isaias of Eritrea. The fact that I mention this important event casually shows how far we have come in one hundred days. Watching Woyane archenemy sitting in Woyane playground Millennium Hall was a surreal experience. For some reason the new picture looked serene compared to times the stage was used to undermine and bully. That was yesterday I know, but worth noticing. It is a very simple message. Apparently that simple message has managed to elude us for a very long time now. I believe Dr. Abiy is trying to wake up our angel self. By accentuating our positive and kind side he has woken up the good and generous inside all of us. Today it is as if we are all rebelling against what we were told to be true for a long time in general and the last forty years in particular. Woyane philosophy, Woyane culture and Woyane outlook that attempted to erode our sense of self worth and replace it with something repulsive and alien to us has been rejected without reservation. Well you don’t see no region, village even individual standing up for Woyane values do you? Our new PM tapped into that reservoir of love, empathy and what we call Ethiopian Chewanet (ጨዋነት) that has been sitting dormant. Naturally it has overwhelmed the seeds of hate and intolerance planted by Woyane. He is challenging us to be like the times we built huge Empires and lived in peace with each other and our neighbors. Today it is all about helping him achieve the goal we have envisioned together. A free, Democratic, prosperous Ethiopia. The relentless struggle against injustice our people waged both inside and out for many years, the special sacrifice by the Muslim community, Oromo and Amhara youth and the prayers of ordinary Ethiopians has sprouted a wonderful leader like Dr. Abiy. He has already prepared the stage for all Ethiopians to breath the wonderful air of freedom. He has given us a good head start. That is what it is, a head start. How far we go and how fast we go is up to us. Ethiopians are obviously showing their solidarity and approval of the actions he has taken the last hundred days. The release of some political prisoners, the repeal of the draconian ‘terrorist’ law and the presence of free media is what is making us hopeful. It is clear the TPLF Woyane mafia group is not at all happy with the way the situation is unfolding. Right now they are the biggest threat to his consolidation of power and Ethiopians returning back to repair their shattered home. TPLF Woyane has many means to destabilize the young PM. They have tried a few. The assassination attempt was too amateurish to believe it was meant to succeed. A warning may be but a futile one. It worked against them. Attempts to show the country’s situation to be ‘volatile’ were manufactured in the south between Sidama and Wolaita, in the west in Assosa and the Sudanese border. All have failed to materialize. The largest TPLF fifth column still intact is in the bureaucracy that has carefully been staffed by loyal cadres and spineless individuals. This group is the one that has the power to work from within and create dissent, confusion and internal conflict. Woyane is the best at this task. They know where to find the weakest link and use the opening to shape the discussion and sabotage any and all activities. They were very successful in the Diaspora. The propaganda empire TPLF built is still functioning. It is conflicted but it shows its color when it feels it has to influence public discourse. Bringing out old Woyane cadres to teach sensibility to the victims is an age-old practice. They always display their toys when they are in hot water. Two such characters from the old military were paraded recently to pretend they are with the PM and at the same time throw shade on our attempt to repair what they broke. It is fair to conclude majority of Ethiopian masses are with the PM. 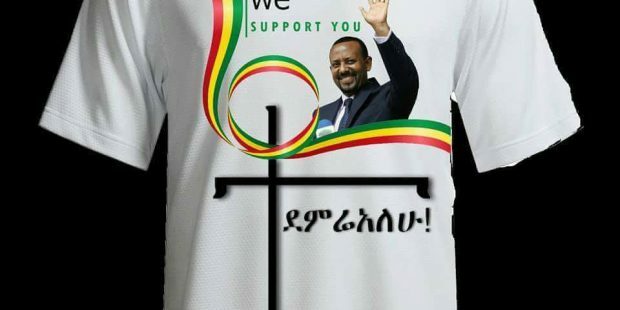 It should be noted Ethiopians support their new PM not because he is EPRDF, not because he is from OPDO but rather they like his message of unity and love and his belief about the wholeness of our land. He has gone the extra mile to place us under one tent called Ethiopia. That is what we love about Abiy, That’s why we love Lemma. They are UN abashed Ethiopians. In the speech with President Isaias PM Abiy used the wonderful science of mathematics to elaborate on the philosophy of ‘Medemer.’ Although one plus one makes two in math he said in our case the addition of Abiy and Isaias rather than creating two separate entities our Medemer creates one whole that is connected symbiotically. Simply put it is a mutually beneficial relationship. It stood Woyanes pseudo philosophy of Kilil on its head. Mutually beneficial relationship requires each to contribute to make the whole better. Mutualism is the key word here. Woyanes philosophy was based on one losing for the other to win. Conflict is the key word with Woyane. The PM also spoke about the need for an open discussion and debate to make the union better. That is a key aspect of Medemer. Like he said “if two individuals agree on all things then the need for the second one becomes irrelevant since he is not adding anything new.” That is a sign of a healthy leader. He is not afraid of being challenged and combat with ideas instead of swords. We are used to ‘strong’ leaders that rule by decree. We also ascribe super human qualities to those that sit on the throne or live in the palace. It is not a winning mindset. There are some that want to muzzle the lively discussion on where our country is heading. They want to leave it to one man to figure out all what’s to be done. They forget what happened the last few times we gave that responsibility to one person. Isn’t that what we are trying to move away from? There are a few that are still peddling ethnic purity and the need to build a party, movement, association based on bloodline. Again their memory of how Woyane met its debacle as we are witnessing today does not seem to faze them one bit. They are happily following the examples of Meles and company going off the cliff. No one explained to me why that did not work for Woyane will work for Amhara, Oromo or other group. Why their new improved ethnic based gathering is different from the old one has not been made clear yet. We are awaiting the PM’s visit to North America. Folks are excited and making preparations on both coasts to shower him with love is an understatement. We are hoping the PM will further explain his philosophy of Medemer and give us a clue on important policy changes he plan to make. We are also hopeful he will encourage the US Congress to SR 168 supporting respect for human rights and encouraging inclusive governance in Ethiopia.